If the EU states have (predictably) combined to support the Madrid regime, and much of the British left seems to be mouthing empty statements about the ‘rule of law’ and ‘the need for unity’ – solidarity will have to come from people and civil society groups across Europe, other international bodies have been less silent. Denying a people the right to express themselves on the issue of self-determination, denying the legality of a referendum, using force to prevent the holding of a referendum, and cancelling the limited autonomy of a people by way of punishment constitutes a violation of Article 1 of the ICCPR and of the International Covenant on Economic, Social and Cultural Rights. We are holding our annual fundraising appeal to try and raise £35,000 to continue and develop Bella Caledonia. If you value this site we need your support to continue. The money will go towards developing Bella as a platform for writers, filmmakers and artists, something that no-one else is doing in Scotland. Add your name to the Catalan Defence Committee Scotland. You can add your name in support HERE today. This is brilliant! I had been arguing exactly this – against European colleagues, some of whom do not appear to understand what democracy means, although they claim to be democrats. The predictable reaction of the EU institutions reveals how far out of touch they are with what constitutes real democracy. It also underlines their own lack of legitimacy – and their supine obedience to Washington. At last, an unequivocal statement of the rights of peoples, which subordinates the rights of states to declare territorial integrity to be paramount. 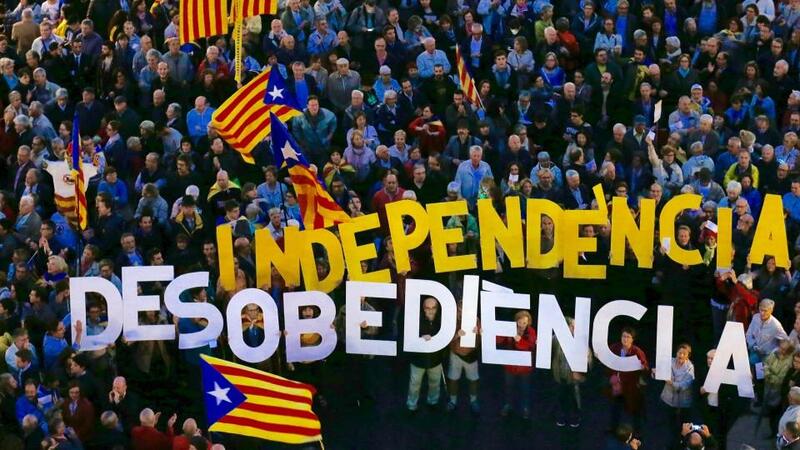 The Scottish Government has already supported the right of Catalonian people to decide for themselves. Thanks for this posting Mike. It is a pity that the reporting in the MSM is so ignorant (wilfully so?) of the sequence of rights. As someone who was pro EU, my confidence in the EU is now wavering. The EU through its stance on Catalonia has shown itself to be centrist and fascist at its heart. Here you go again Willie. Fascists everywhere. FFS you’re wasting valuable language. The Spanish state is not fascist and neither is the EU. There are important things going on right now and the kind of language you use is not only pointless and self-aggrandising but damaging to democratic argument. This is fundamental stuff – thank you Mike. To make the point Alfred de Zeyas is challenging all governments to remember that the right of self-determination surpasses national constitutions and government manifestos. This is the starting point in the way societies are organised. EU please take note and Theresa, remember that you cannot obfuscate. The SNP have a mandate with a timescale that you cannot deny. So when we say it is time for a referendum, it indeed is time.